Early Look at Macy’s Thanksgiving Day Parade, featuring Girl Scouts! 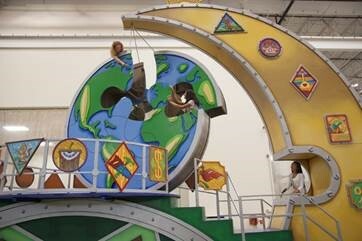 Thanksgiving is almost here and we are thrilled to provide a “sneak peek” into the incredible Girl Scouts-themed float for the 90th Anniversary Macy’s Day Thanksgiving Day Parade® and how our innovative Girl Scouts are “Building a Better World”! On the float, (pictured below and featured on the Today Show this morning), girls will be “building a better world” by climbing and belaying on giant 3-D puzzle pieces that form a globe, using levers to connect the pieces. The float’s features and activities represent what Girl Scouts past and present have done and continue to do as they take action locally and globally. From discovering new things and participating in outdoor adventures to developing entrepreneurship skills and exploring science, technology, engineering, and math (STEM), Girl Scouts are taking the lead to positively impact our world. Although this year will mark the 90th annual Macy’s Thanksgiving Day parade, you don’t have to wait until next week to start enjoying it! John Piper, vice president and lead designer of the Macy’s Parade studio, shares a preview of the newest attractions, including the Girl Scouts’ “Build a Better World” float on Today Show. The 90th Anniversary Macy’s Thanksgiving Day Parade airs nationwide on NBC-TV, Thursday, November 24, 2016, from 9:00 a.m. to noon, in all time zones. For more information on Macy’s Thanksgiving Day Parade, please visit www.macys.com/parade. The Invite-A-Friend Promotion Starts Today!